Hello, my name is Glenda Barton. I live in southwest Arkansas where the summers (and sometimes fall) can be blazing hot and full of humidity…which does not mix well with cake decorating I might add!! I have been decorating cakes as a hobby for family and friends for about 35 years. I have some crazy things I could tell you but I’ll save that for another time. The story of my slipper cake begins about 13 years ago, when my daughter married a man that had two little girls. They lived in Tennessee and so I never got to know them or see them as much as I would have liked to. My daughter gave her all and loves them (as we all do) as her own. The girls have since grown into lovely young women with the eldest having been married for 6 years now and having three beautiful babies of her own. They are the sweetest and most precious little things ages 4, 2 and 2 months. As with their mom, we don’t get to be around them a lot. But we have managed to get to know them through Skype and occasional visits. One such visit was last September as we gathered for the youngest daughter’s wedding. I wanted to do something extra special for the bride though the wedding (magnificent by the way) and other festivities were already planned to perfection. Knowing she has always loved Cinderella’s castle in Disney World, I thought perhaps the slipper cake would somehow show her how I feel, that she is a princess to all of us. So….after figuring out how I was going to accomplish this feat from 600 miles away, the challenge was on. The first thing was the slipper. I purchased a mold and made a couple of “test ” slippers…mainly just to see if I could. I used Wilton candy melts, the prototypes turned out pretty great so I fashioned the white one and covered it with coarse sugar sprinkles so that it would sparkle and shine. The insole was light pink fondant with the phrase “happily ever after” inscribed in gold. The cake was her favorite of course, strawberry with cream cheese icing (on the side). I carved out the pillow and covered it with fondant that I decorated with white candy pearls and gum paste roses, rope and tassels. I left off the tassels, roses and slipper until just before the dinner. Now for the fun part…driving 600 miles in the heat with a carload of other wedding props and miscellaneous items.Not to mention luggage filled with three days clothing plus our wedding attire! I carefully wrapped the slipper in a zip lock bag and placed it into an ice chest with ice in lidded containers as not to have the ice melt and chance water getting into the bag and onto the slipper. I then got a box that would hold the cake plate tight against the sides and secured it with tape so that it could not slide inside the box. What was funny to watch was the faces of everyone when we carried an ice chest and a box into every place we ate or stayed along the way….having to explain many times so that we weren’t mistaken as suspected terrorists and such!!! 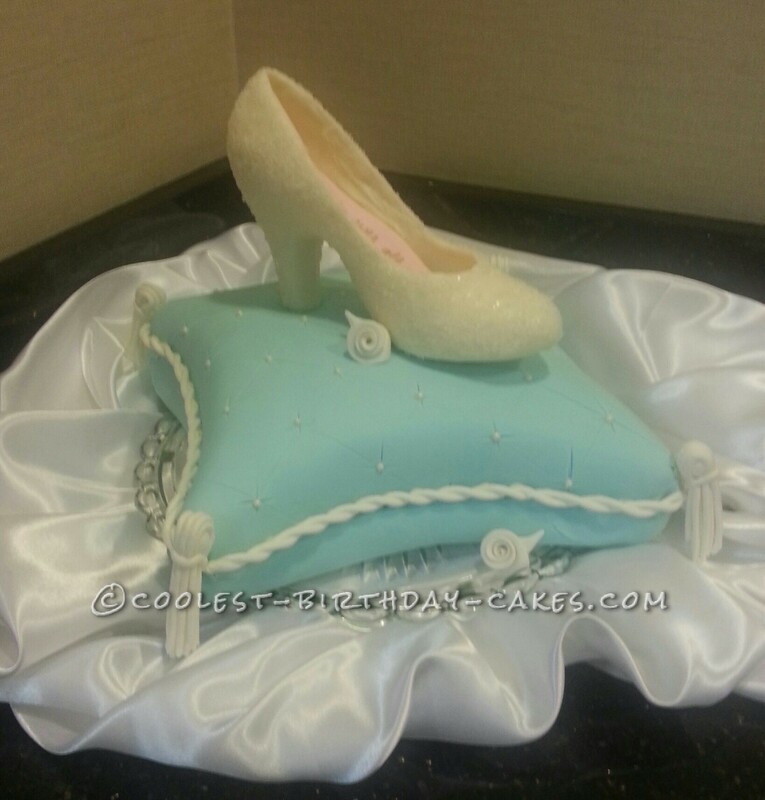 But the cake and slipper arrived totally in tact so the rest was (pardon the pun) a piece of cake! While everyone was at rehearsal I put the cake together. When she walked in and saw it she cried. I could see in her face how much she loved it and she almost didn’t let us cut it !! Later, on Facebook she said it was the best surprise. I only hoped I could make her special day even more so. She was a beautiful bride and that night her hugs made me feel special.